The respiratory system is one of the most commonly affected systems in the human body. Every breath we take has the potential to cause an infection or disorder of the respiratory system right from the nose to the airways to either of the lungs. Most commonly, it is an infection that causes respiratory disorders but there are rare genetic mutations that can cause conditions right from birth. One such rare disorder is called as Cystic fibrosis. It is the result of a genetic mutation (abnormal alteration) that affects the water and salt balance in the body. The gene is responsible for absorption or excretion of salt and/or water at the cellular level in various tissues of the body like the liver, pancreas, sweat glands, kidneys as well as the lungs. Due to the mutation, the gene stops exerting its influence on the cells and the salt-water balance gets hampered significantly. In the lungs specifically, this leads to reduced chloride secretion from cells lining the airways along with increased absorption of sodium. Together this leads to an imbalance in the salt-water content of the mucus of the airways. The mucus becomes too thick, doesn’t clear by gravity and leads to accumulation within the airways. This causes chronic infections with certain bacteria. Pneumonia, on the other hand, is a condition where there is an infection of the lung tissue leading to consolidation of cells. The infection can be due to viruses, bacteria, fungi, etc. The infection can be acquired outdoors as well as in patients already admitted in the hospital for some other condition. Symptoms of cystic fibrosis are a typically salty sweat. Other symptoms are of individual disorders of the systems affected. Like if there is a lung infection due to poor mucus clearance from airways it causes coughing, expectoration of phlegm, fever, recurrent respiratory infections right from childhood, poor weight gain etc. Pneumonia manifests as high fever with chilliness/trembling, chest pain, cough with phlegm, anorexia, nausea/vomiting, breathlessness and gasping occasionally. Diagnosis of cystic fibrosis is done by checking the chloride levels of the sweat. They are typically elevated. Pneumonia is diagnosed with a chest x-ray, blood counts showing elevated white blood cells, sputum sample for culture and maybe even a CT-scan of the chest. Prognosis of cystic fibrosis is fair. Palliative treatment and nutritional support is necessary throughout life. The people can lead a fairly normal life but tend to have multiple disorders like chronic pancreatitis, gallstones, recurrent respiratory infections, poor weight, weakness, nutritional deficiencies etc. Prognosis for pneumonia is good if detected quickly and treated vigorously. With 4th generation antibiotics, pneumonia is very much treatable and curable. Hospitalisation is almost always necessary and intensive treatment is required. 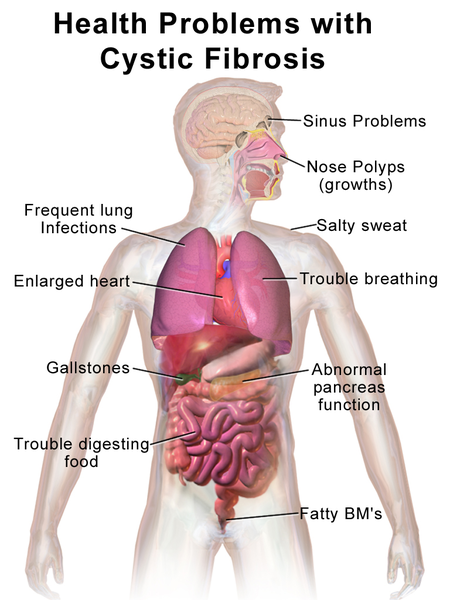 Cystic fibrosis is a genetic disorder where the salt-water balance in the body is disturbed. It affects multiple organs like pancreas, liver, lungs, sweat glands etc. Symptoms are seen in the affected organ systems. In lungs, we see recurrent chest infections, chronic weakness, and chronic cough. It is incurable but palliative support for symptoms is satisfactory. Pneumonia is an infection of the lung tissue due to microbes. It causes high fever with cough and sweating, breathlessness and chest pain. It can be taken care of by antibiotics and anti-fungals. Hospitalisation is necessary. Difference between pneumonia and lung abscess. rachita. "Difference between Pneumonia and Cystic Fibrosis." DifferenceBetween.net. August 8, 2014 < http://www.differencebetween.net/science/health/disease-health/difference-between-pneumonia-and-cystic-fibrosis/ >.